Cheers for the Capital ‘R’ change, it looks a lot better than before. Under Java, the slash through the zero is rendered very heavily, so too ‘NMWZ’, lowercase is perfectly fine. see image for a screenshot As you have said before, Java has a bastardised font renderer so it may never look as awesome as on the mac/win native renderer. That’s almost certainly a problem with the font itself - I’ll take a look tonight. Probably one of the Mac-specific metrics gone askew although I tested it with Terminal before release. To echo Andrews comment and provide more info; it only happens at sizes 12 and 13. Works otherwise. This font is absolutely awesome. The VS italics hack is brilliant! Envy Code R is my favourite coding font from now on, beating Consolas and Inconsolata. Thank you, and keep up the great work! I would like to suggest a tweak to the comma. It is difficult to see the difference in smaller point sizes between a comma and a period, and between a colon and a semi-colon. I’m really not sure what is causing it. I will have to install NetBeans or JEdit and try experimenting. At a guess I’d say it could be something off with one of the metrics but they are auto-calculated by the design software. Not entirely sure what you mean by the full-monty. You mean more of a curve on the existing open-tail or conversion to a full loop-tail? I’m not a big fan of loop-tails when used in fonts designed for clarity/small sizes so I don’t see that happening but I could re-introduce a curve if there was demand. When I entered the message, I included the g, and got the andale/consolas/pragmata version as example, but the posted version doesn’t show this. I’ve used Envy fonts, and generally like them, except for the g. Many fonts leave the descender too small and the circle too large, Envy R not as much as some. The other versions have g as a very unique glyph; it can’t be confused with anything else. Likely more work, too; I suspect. As to the java issue. I use jswat debugger, and Envy R is unreadable. About the only one that works is Andale; dotted zero looks too much like an 8. Damien, I am so pleased with your font. I cannot explain enough how nice they look under Gnome on my 19’ LCD display. Here’s the screeny: http://www.amiroff.com/wp-content/uploads/2007/10/envy_code_r9pt.png For combarison, Monaco from Apple: http://www.amiroff.com/wp-content/uploads/2007/10/monaco9pt.png I don’t know about the license you’re planning to distribute them but the reality is, *Nix world needs fonts like these so much! Keep up the great work! Thanks for the kind words - it’s good to know they look pretty good under Gnome. The font will remain free-of-charge but copyrighted for now but if any of the Linux distributions are actually interested in including it I could quite likely be persuaded to switch to a proper open license. I can’t seem to install the font(s) on Vista. I get some error: The file is not a valid font file and cannot be installed. Is this a Vista problem? Or is there some special way to install the font other than to drag and drop the font files into the font folder? Hmm, not sure why that might be. I have finally got a copy of Vista (via the MS employee store for $45 :D ) and will be installing it just as soon as my new HD arrives (about a week). Will be able to test then and issue a fix. I’ve been using Triskweline quite happily, at 12.5 or 13pt on a Mac, http://www.netalive.org/tinkering/triskweline/ I find it open and clear. It’s okay, your comments can stay :) I’ll give that one and shot and see what it looks like. The real problem is that the renderers on Windows, Mac, Linux and Java all draw the fonts very slightly different and diagonal lines is one of the major headaches. What looks great on Windows looks too heavy on Mac/Java… Once I get this font looking just how I want (probably PR7) then I’ll have to seriously look into hinting the font to try and get it spot-on for each platform. Failing that I could branch off another version and tweak that for 13pt on the Mac to look just as good (I find all the characters are a bit bold on the Mac atm at 12.5). comma and semicolon need a bit more “swing”. 2. Java rendering of 0 is suboptimal (but you know that). 3. WNM all get really smeared out when bold, especially in Java at 13pt. Great work! Great font, I’d like to use it instead of Droid Sans Mono. Unfortunately does not work with Russian Windows-1251 codepage. Awesome work! This is a killer programming font, and looks to replace my current Bitstream Vera Sans Mono preference! It’s the best font for programming I have ever used. Its compact, clear and nice. Thank you for the development! Having gone through a barrage of monospaced fonts, I realized Envy Code R is by far the best free font available. Although, I really liked Paragmata font, I couldn’t use it due to the hefty price tag on it (‘am not earning yet). Envy Code R has everything I liked about Paragmata, so basically it’s a no brainer for me. Thank you Damien! pretty font but not very usable IMHO. on my screen, commas look like periods. semicolons look like colons. two of the most important characters in C# coding. Wow!!! This is the best font I have ever seen. Thank you. Go into Start Menu > Control Panel > Fonts Now unzip the file using extract all. 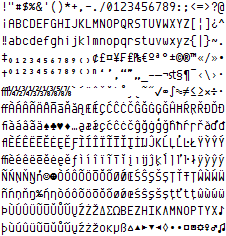 Then drag the .ttf and .otf files from the unzipped folder into the Fonts window. I’m using the fonts in my text editor, too. Very clear. This is just..WOW!!! amazing, perfect coding font! Thanks…it works really nice on e-text editor and Aptana IDE.